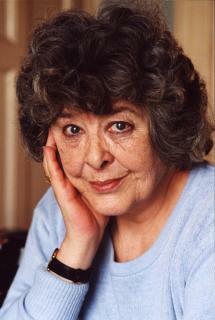 Classics: Diana Wynne Jones R.I.P. Celebrating the author of Archer’s Goon, Howl’s Moving Castle etc. 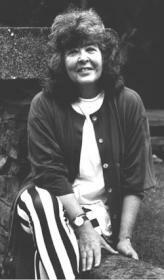 When Diana Wynne Jones died last month of lung cancer, the Wellington Public Library noted her passing by erecting a little black-curtained shrine to her memory, consisting of a cardboard sign : “Diana Wynne Jones 1934 – 2011” with a pile of her books in a semi-circle underneath. Children’s librarians always did love her books – more so perhaps, than some of the children steered hopefully towards them. You like Harry Potter? Well, try this one, dear. Let’s put that another way. There are children who love Diana Wynne Jones’ books, and with good reason – but they’re a fairly select crew. In book after book after book – at one point she had written 20 full length novels in 20 years – Jones would take recognizable family situations, and cook them in a rich brew of fantasy elements, intricate plot convolutions and deadpan wit, such that even adult readers could sometimes find it hard to keep their bearings. As one reviewer of Archer’s Goon confessed, he couldn’t really summarise the plot because he didn’t understand it, entirely. One can sympathise. The originality and intricacy of her plots were DWJ’s forte …a close encounter with say, Archers’ Goon or Dogsbody or Fire and Hemlock or The Homeward Bounders will test the mettle of any reader, but offer rewards likely to last a lifetime. At a certain age, children will read and re-read books they like, and DWJ is ideal fodder for that tendency. The books keep revealing more and more, each time. Still, the downside of her prolific output was that sometimes readers might have preferred that she had stopped churning out the books, and taken more time to sort out the resolution of her brilliantly conceived stories. As she told reviewers more than once, often while writing one book, she would find the next one “ coming up underneath” – and sometimes it showed, as her interest level waned for the task at hand. Often, her originality also involved a postmodern reliance on conventions that the reader was expected to recognise, and enjoy the tweaking thereof. Those conventions were well camouflaged. Yet for all its mythological grounding in the legend of Tam Lin, and alongside its T.S. Eliot–derived narrative devices, Fire and Hemlock is essentially a Mills and Boon romance : ardent young woman, older man burdened by the fates, love endures. Similarly, Archer’s Goon is a detective story full of red herrings and hidden clues, with the final plot twist unveiled after interviews with all the usual suspects. Dogsbody for its part, is a highly original variation on the kind of animal stories that feature a lonely girl and a litter of abandoned puppies. It begins with a simple enough premise – what if stars and planets had personalities and fates of their own? We quickly find out that the puppy at the centre of the story is actually Sirius, the Dog Star. Sirius has been falsely convicted of murder on his home planet and sentenced to a life on earth as a puppy, and given only the span of a dog’s life in which to prove his innocence. That’s when things begin to get complicated. Sirius’ deliverance depends on whether he can find a magical device of mass destruction (called a Zoi) that has accidentally fallen to Earth as a kind of meteorite. While doing so, he has to avoid the murderous intentions of his star companion (formerly, his one true love) who not only framed him, but now wants to kill him. To make matters even worse, Sirius begins his sojourn on Earth by being tied in a sack by his cruel human carers and dumped in the river, along with siblings Rover, Bruce, Patchie and Redears. In the nick of time, the puppies are rescued by Kathleen O’Brien, an Earth girl whose father is locked up in prison. Ultimately, Sirius learns how to let go of a love that was based on wishful thinking. He comes to appreciate the new home that he briefly inhabits…”the “beautiful and kindly planet …that had taught him everything he knew..” Typically though, neither Kathleen nor Sirius live happily ever after – although they do earn a place of sorts, in the universe. The outcome, once again, feels as though Jones was unable to resolve her story (or had lost interest in doing so ) at an emotional level that does justice to what had come before. Like most divinities, Sirius is far less interesting as a god than in his human (or canine) aspects. What one comes to realize with DWJ books is that the getting there is often more fun than the arrival – and yet to her devoted fans, this aftertaste of unfinished business and a somewhat chilly intellectualism is all part of what made her unique. At home, he was majestic enough; preaching, he was like the prophet Isaiah. He spread his arms and language rolled from him, sonorous, magnificent and rhythmic..Though I never understood one word, I grasped the essence of a dour, exacting and curiously magnificent religion. His voice shot me full or terrors. For years after that, I used to dream, regularly, that a piece of my bedroom wall slid aside revealing my grandfather declaiming in Welsh, and I knew he was declaiming about my sins…At the bottom of my mind there is always a flow of spoken language that is not English, rolling in majestic paragraphs and resounding with splendid polysyllables. I listen to it like music when I write. He came rowing angrily across and ordered them off, and, after finding where they lived, said that he wasn’t going to be disturbed by a parcel of evacuees, and announced he would come next morning to complain.. Next morning, I stood in the hall, watching [the mothers] rushing about trying to find coffee and biscuits (which were nearly unobtainable by then) with which to soothe the great Arthur Ransome, and I gathered that I was about to set eyes on a real writer. I watched with great interest as a tubby man with a beard stamped past, obviously in a great fury and almost immediately stormed away again on finding there was nobody, exactly, to complain to. I was very impressed to find he was real. Up to then I had always thought books were made by machines in the back room at Woolworths. An old woman with a sack over her shoulder stormed out of the house and hit both of them for swinging on her gate. 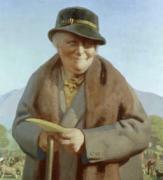 This was Beatrix Potter. She hated children, too. 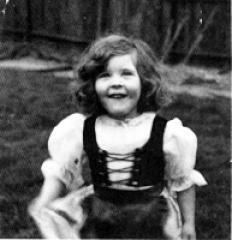 Like other talented children’s authors of her generation ( Penelope Lively, Susan Cooper) Jones went up to Oxford in the early 1950s. It was a difficult time. Her father had just died from cancer and Jones was worried about the ability of her sisters to cope with caring for their mother. I have never really lost the sense that the world is basically thoroughly unstable. I think that is why I tend to write about multiple parallel worlds – anything can happen, and probably is, somewhere. One of the other indelible images of Jones is her enjoyment of the act of writing. When she started out in earnest in the early 1970s, her children would reportedly often come to the door of her study – drawn there because inside, their mother had been typing, and was laughing uproariously at what she was writing. For this essay, I’ve singled out Archer’s Goon, but other DWJ books have just as much to offer. We begin with the usual sturdy domestic setting, at home with the Sykes family. The household includes Howard (the book’s narrator) and his father, Quentin – whose task it is to supply 2,000 words every three months, apparently as a kind of tax to one of the siblings who ‘farm’ the various aspects of the town’s services, crime included. Archer is one of the seven siblings, and his Goon turns up in the very first sentence to claim his due: “The trouble started that day Howard came home from school to find the Goon sitting in the kitchen…” The Goon is tall with long arms and a small round head, wears boots on his enormous feet, carries a sharp knife in his pocket and has “ a half daft” expression on his face. It pays to increase your word power. Needless to say, each of these maxims comes into play at some point in the story. I won’t spoil the plot for anyone embarking on Archer’s Goon for the first time. Suffice to say, the 2,000 word treatises that Quentin must supply each quarter are neither a tax nor a magical spell, but are merely the first of many false leads as Howard works his way around the cast of siblings – Archer, Dillian, Shine, Hathaway, Erskine, Torquil and Venturus – to try and discover the town’s supreme overlord. If you’ve ever read Agatha Christie’s story The Murder of Roger Ackroyd you might have some inkling of the ultimate trick that Jones plays on the reader here. Which, finally, raises a relevant point. How fair is it that child readers in particular should be required to know about the conventions of the various genres that Jones plays with so ingeniously? Maybe it isn’t fair, but it isn’t a mortal sin, either. Asking more of children than they can take in at the first attempt is a rare enough fault that one should probably be as inclined to applaud it as to condemn it. There is always enough happening to keep most readers interested and amused, and many young readers will keep coming back for more. Still….it might help to explain why – despite her popularity in Britain – Jones never really cracked the US market, even after Harry Potter had whetted the appetite for fantasy in children’s fiction. Right. Plenty to admire, and some reasons for feeling ambivalent. That seems fair. Besides, DWJ never seemed to be all that much concerned with popularity, per se. As a writer for children, she always took care to provide a moral conclusion where good triumphs over evil – but this didn’t extend to a conventional ‘happily ever after’ outcome for her characters. Typically, she once claimed to be more concerned with ‘people coming to terms with the nastiness in themselves’ than with happy endings. For this essay, Gordon Campbell drew on volume 7 of the Something About the Author series, volumes 7 and 120 of the Children’s Literature Review and several rewarding conversations with Grace Russell.